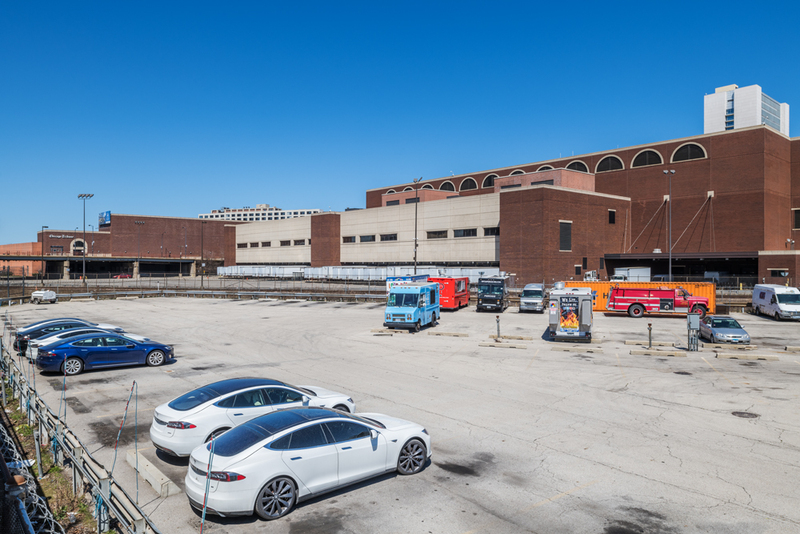 As Dennis Rodkin reported in Crain’s Chicago Business, the raw concrete walls of the atrium of River City was recently pained white as part of a conversion of the building from condominiums to rentals. I shot the atrium back in 2016, well before any changes were made. 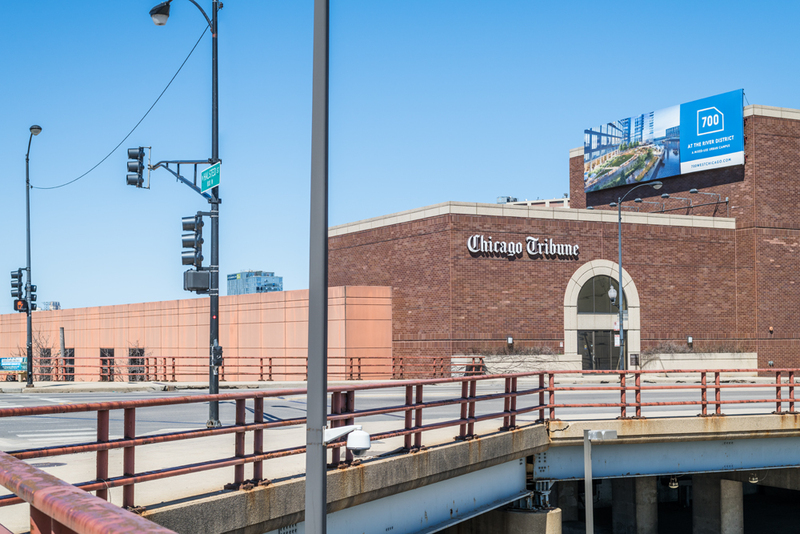 Since 1981, the Chicago Tribune has been printed at the Freedom Center, an immense plant situated on a 30 acre site near the corner of Chicago and Halsted. 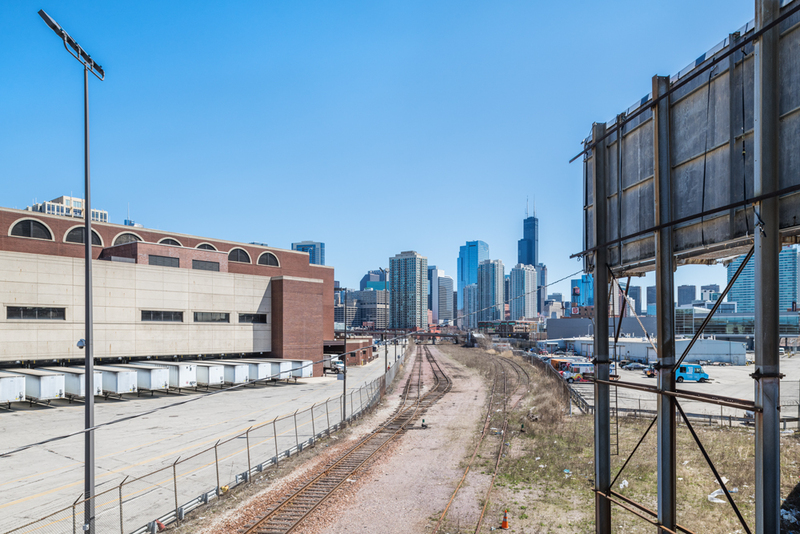 This may end soon as there are plans in place to demolish the plant in favor of a mixed-use mega-development tentatively called "River District." I've documented as much of the exterior as possible before any work has begun. I'm going to do one more round of this, and then if demolition and redevelopment do indeed occur, I intend to photograph the entire transformation. More to come. 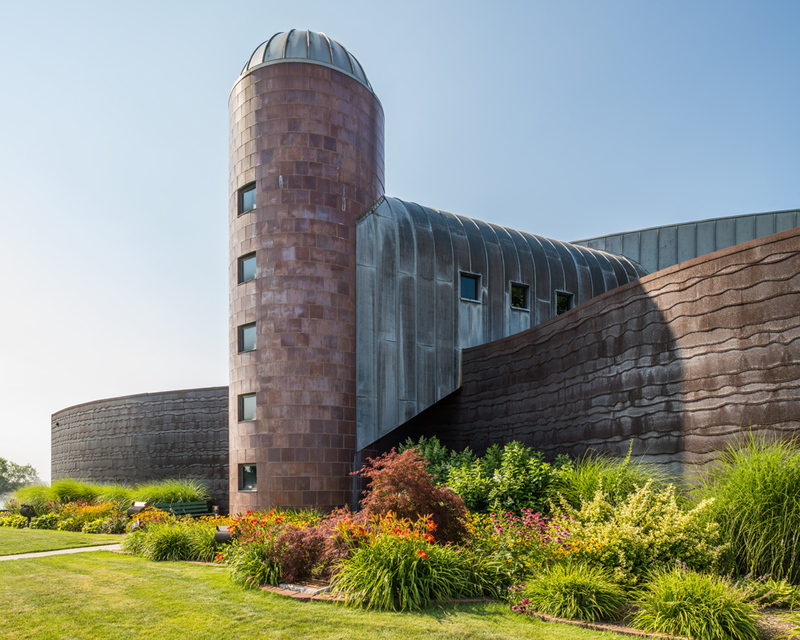 The Indiana Welcome Center is a surprising example of Post-Modern architecture, unexpectedly situated off of Interstate 80, five miles from the Illinois border in southern Hammond. It opened in 1999 as the Lake County Interstate Visitors Information Center and was designed by a Valparaiso-based firm called Design Organization, Inc., who were eventually acquired by Shive-Hattery in 2012. Design elements of the building symbolize four distinctive aspects of the multi-faceted geography and economy of Northwest Indiana. The pillars marking the entry evoke the smokestacks of the nearby steel mills and oil refineries, most notably BP-Amoco in Whiting and The U.S. Steel Works in Gary. 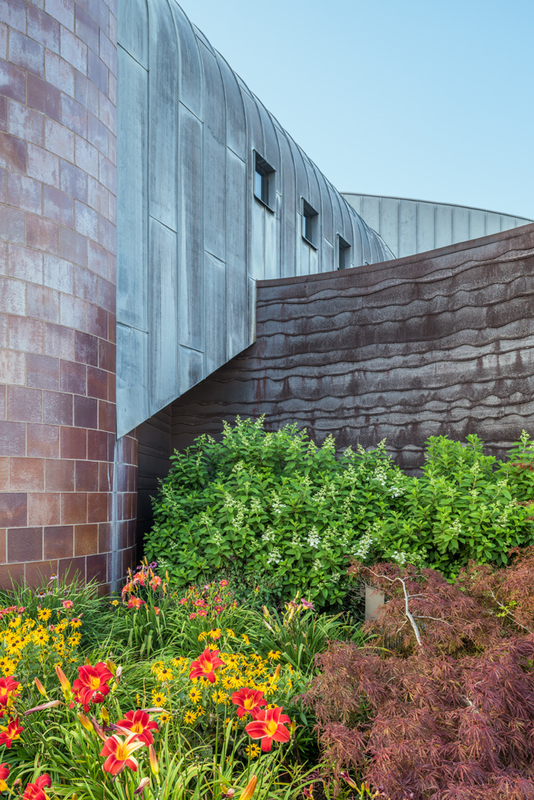 The cascading aluminum siding that covers the exhibition hall suggests the ebb and flow of waves on the shoreline of Lake Michigan. This element is juxtaposed with a rolling concrete wall bisecting the circular form of the entire building, reflecting the terrain of the Indiana Dunes to the east. Finally, the southern facing side is capped by a tall (non-functional) silo, symbolizing the largely agricultural economy to the south. The jump-cut interplay of varied symbolic elements is in line with the strain of Post-Modernist architecture practiced by Stanley Tigerman, Michael Graves, and Robert Venturi, but was built at least a decade after that style faded out of fashion. Perhaps it took this brand of Post-Modernism a long time to move into the heartland. Or perhaps it was the best design solution to communicate the aims of the Lake County Convention and Visitors Bureau, telling the story of the region in a single structure. It stands nonetheless as an idiosyncratic example of very late Post-Modernism, rare in this part of the country, and an unexpected surprise to visitors passing through Northwest Indiana. Cobbler Square Lofts in Old Town is a renovation of a Dr. Scholl's shoe factory, completed in 1985 by Kenneth Schroeder & Associates. The factory had consisted of twenty buildings within two square blocks, built between 1880 and 1965. A few of these buildings were demolished during renovation, but the overall character of a multi-generational factory complex was retained. There are three internal courtyards designed by POD, Inc. (a California-based landscape architecture firm) set off-axis 45 degrees to the street grid. 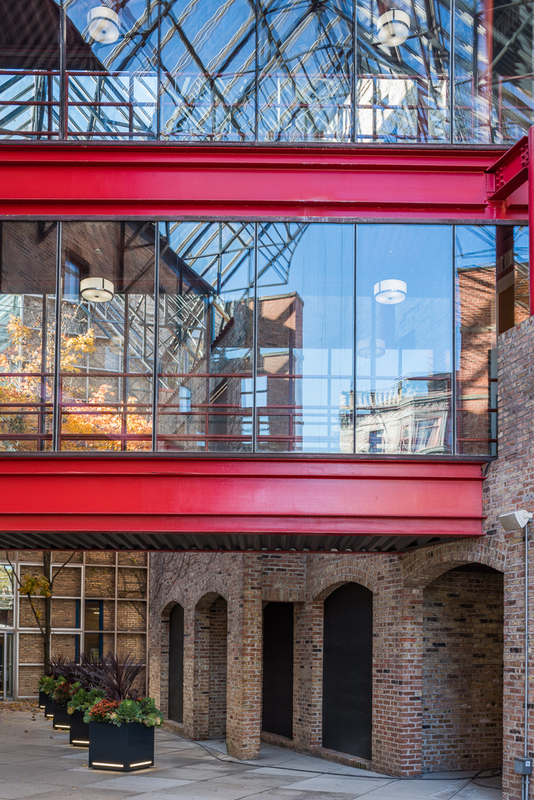 The main entrance on Wells street is a cutaway into the facade of the 1959 factory building, with a glazed atrium in red and blue steel providing a sense of grandiosity as one enters. I believe that in the near future this atrium will be of particular interest from a preservation standpoint. 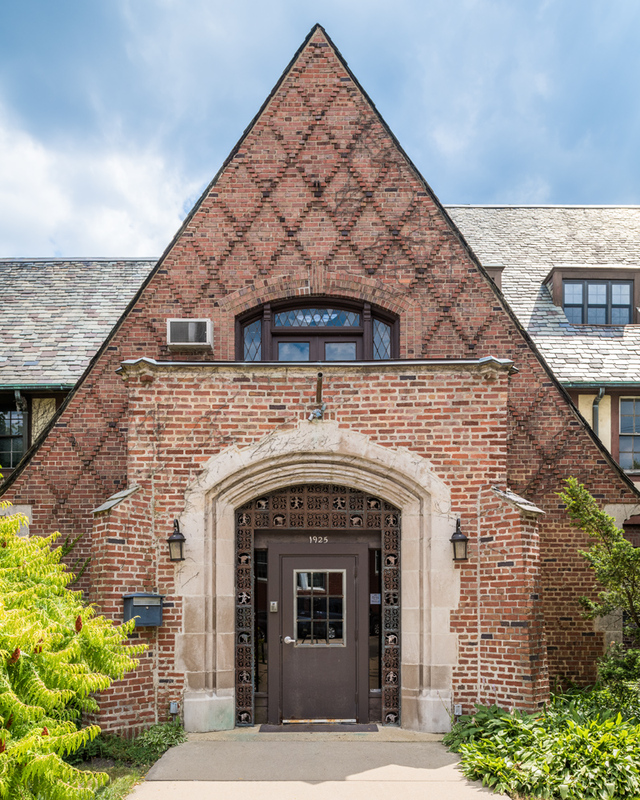 It is an example of Hi-Tech, a sub-style of Post-Modernism, that was uncommon in Chicago during this time period. Architect Kenneth Schroeder described the design aesthetic as "layering the new against the old," and that was certainly achieved. Thirty five years since the renovation, there isn't a feeling of rupture. Rather, the additions made in 1985 fit seamlessly into the exisiting fabric. 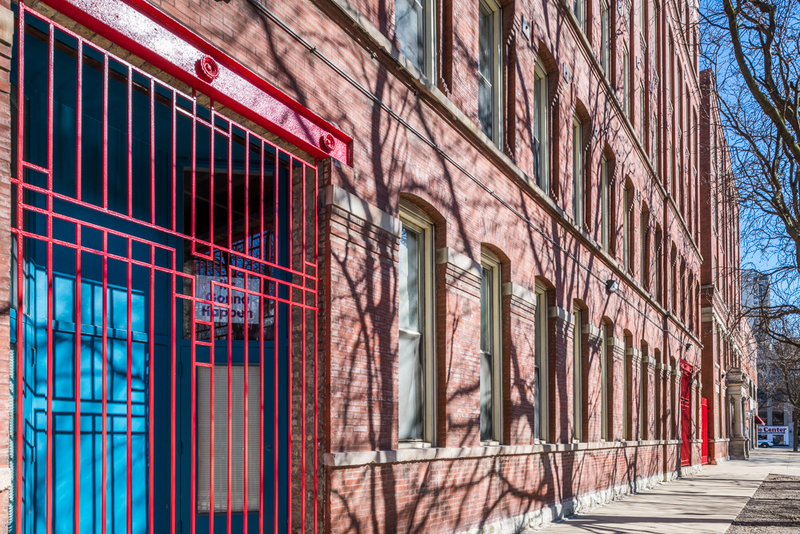 If disused factory buildings had any hope of surviving the changing economic and social conditions in large American cities, some kind of modification was necessary. Here, it was done in a manner that added to the richness of the pre-existing built environment. 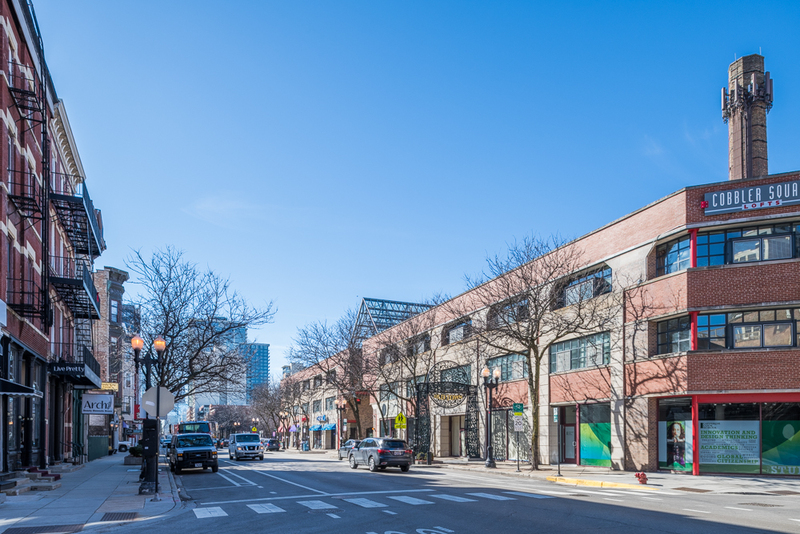 When it soon comes time to reassess Cobbler Square Lofts, it is this point that should be at the forefront of our considerations. In 2014, McDonalds announced a series of sustainability goals, called the McDonalds Global Sustainability Framework. Aspects of this plan included changes in the sourcing of beef and coffee, an emphasis on recycling, increased energy efficiency, and the introduction of more fruits and vegetables to the menu. McDonalds' new flagship location, unveiled earlier this month, is a three-dimensional representation of these initiatives. 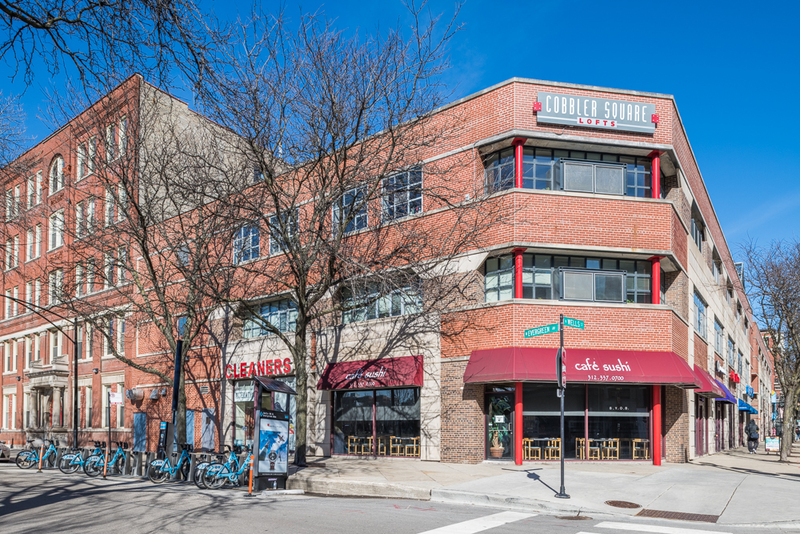 Located in River North, the new structure is built on the site of the previous flagship, which in turn was built on the site of the old Rock N' Roll McDonalds. Designed by Ross Barney Architects, the new flagship is a three-story modernist glass jewel box situated within a white steel frame supporting a canopy of solar panels. Further enclosed within the building is a floating garden, which is flanked by a vertical canopy of live plants. There is a landscaped public plaza, parking lot, and drive through, all laid with gray permeable pavers. 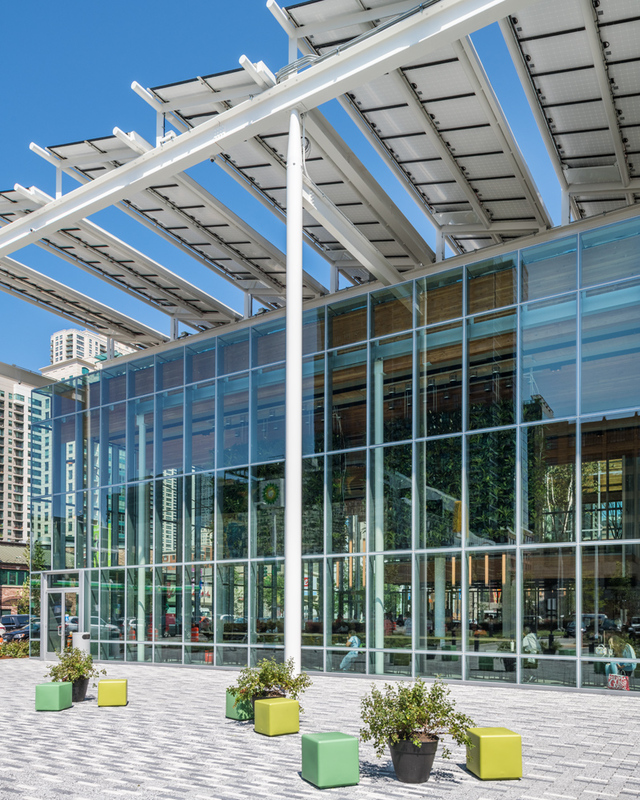 Each design decision (solar panels, permeable pavement, living walls) carries a strong implication of environmental friendliness (the building is LEED certified, of course), reifying McDonalds' corporate ethos of sustainability. Situated in a busy tourist district, this building will serve as a convincing advertisement for the values McDonalds is trying to project moving ever forward into the 21st Century.